Newton, Brandi. "Athabasca River". The Canadian Encyclopedia, 24 January 2018, Historica Canada. 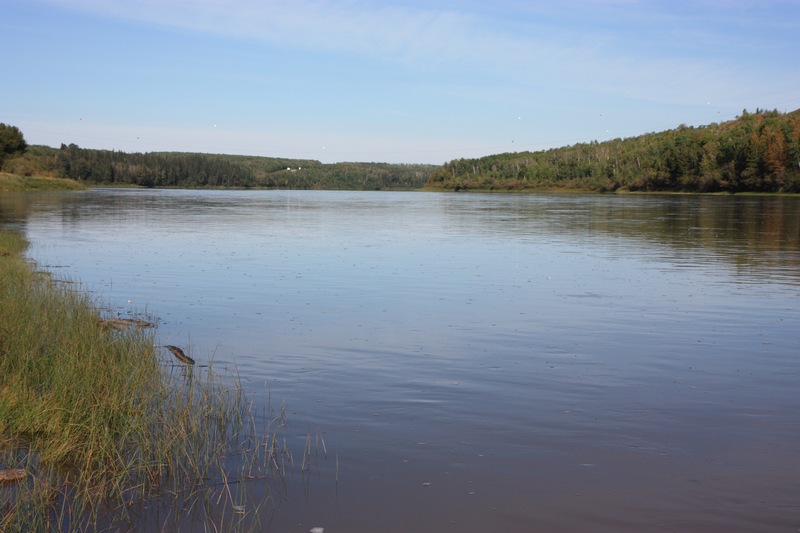 https://www.thecanadianencyclopedia.ca/en/article/athabasca-river. Accessed 25 April 2019. The Athabasca River is the longest river in Alberta (1,538 km). 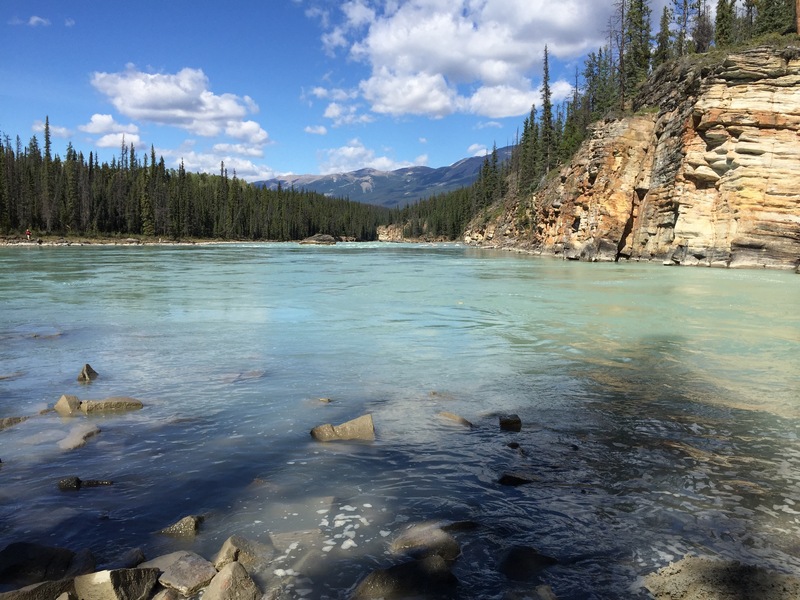 The first 168 km (located in Jasper National Park) are designated as a Canadian Heritage River. As a tributary to the Mackenzie River, water flowing on the Athabasca River eventually drains into the Arctic Ocean. River flow is highest during the summer and lowest during winter, and it is ice-covered from mid-November to mid-April. The Athabasca River just below the Athabasca Falls in Jasper National Park, Alberta (2016). The Athabasca River headwaters are located on the eastern slopes of the Rocky Mountains, at the Columbia Icefield. It flows northeast through the steep mountainous region of Jasper National Park and past the foothills region where it is joined by the Berland and McLeod Rivers, before entering a boreal forest region. Between Whitecourt and Athabasca, the Athabasca River is joined by the Pembina River and Lesser Slave River, draining Lesser Slave Lake, and upstream of Athabasca, the Athabasca River and numerous tributaries (including the Clearwater, MacKay, Ells, Firebag and Richardson Rivers) flow through the Athabasca oil sands deposit. Approximately 200 km past Fort McMurray, the Athabasca River splits into two main channels and flows alongside Wood Buffalo National Park as it enters the Peace-Athabasca Delta and drains into Lake Athabasca. The Athabasca River at Athabasca, Alberta (2016). The Athabasca River flows across four ecological regions: Rocky Mountains, Foothill Forests, Temperate Grasslands and Boreal Forests, each home to a rich assortment of flora and fauna.Vegetation in the Rocky Mountains includes alpine fir, Engelmann spruce, Douglas fir and lodgepole pine, while wildlife includes bighorn sheep, grizzly bears, mountain goats, caribou and elk. Black bears, wolves, moose, beaver and deer are found throughout the Athabasca River basin, as well as aspen, balsam poplar, white spruce and balsam fir. The Boreal Forest region contains black spruce, mosses, shrubs and wetlands, and is home to lynx, muskrat and ruffed grouse. The Peace-Athabasca Delta is the most ecologically diverse area, home to numerous migratory birds, including ducks, geese and whooping cranes, as well as the world’s largest herd of bison. 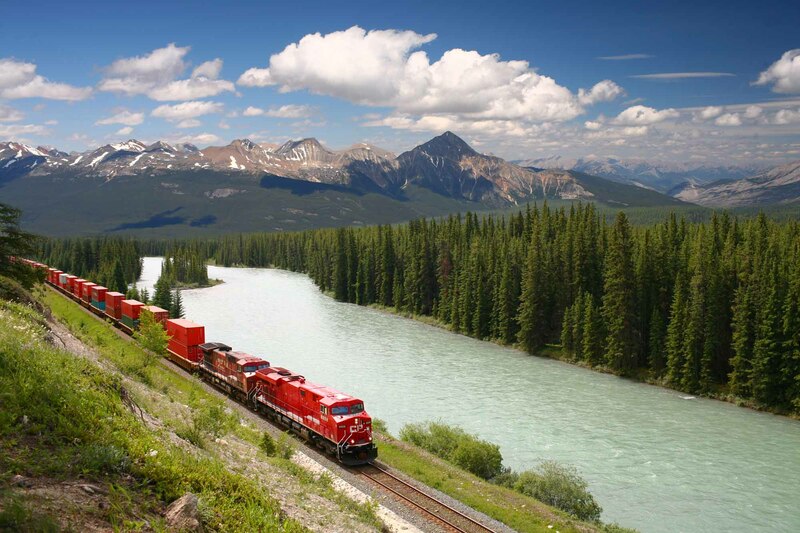 There are numerous environmental stressors along the Athabasca River, including forestry, agriculture, pulp and paper mills, and the oil sands deposit. The oil sands have both natural and anthropogenic (i.e., human induced) effects on the environment. 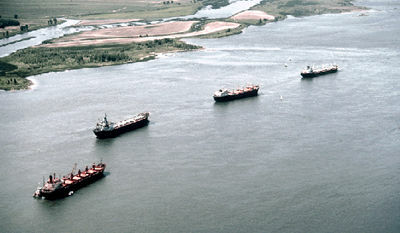 For example, the sediments in the oil sands region contain toxic substances that are naturally eroded by the river. Additionally, water from rainfall or melting snow flowing over or through the ground picks up contaminants before reaching the river. Large areas of wetlands and boreal forest have been cleared for oil sands industrial development, which has led to loss of biodiversity and habitat for wildlife, including migratory birds. Pollutants, including polycyclic aromatic hydrocarbons, mercury, methylmercury,zinc,nickel, lead, copper, cadmium, thallium and vanadium, are all emitted by the mining and processing of bitumen. Recent research has found substantial deposits of these airborne particulates on land, water and snow, as well as in lake sediments. The highest concentrations of the particulates are located closest to the oil sands development in what has been called a “bullseye” pattern extending as far as 200 km. The relative contribution of pollutants from natural and anthropogenic sources and the effects of these pollutants on wildlife and fish is poorly known due to the lack of adequate long-term environmental monitoring. Efforts have been made to engage First Nations in the monitoring process, as these communities have historically raised concerns over water quality, the health and abundance of fish, declining populations of waterfowl, and high rates of cancer downstream of the oil sands. The Athabasca River and its tributaries have provided vital transportation routes for First Nations and Métis inhabitants, early European explorers, and the fur trade.Additionally, the vegetation, mammals and waterfowl that populate the Athabasca River basin, as well as the fish in the Athabasca River and Lake Athabasca, have provided essential sustenance and materials to sustain traditional First Nation lifestyles. Numerous tribes hunted along the Athabasca River, including Sekani, Shuswap, Kootenay, Salish, Stoney and Cree,while Chipewyan, Cree and Métis settled in the Lower Athabasca region. In 1778, Peter Pond established the first fur trading post along the Athabasca River near the delta, and was key to establishing trade routes and furthering exploration. Cree people along the Athabasca River played an essential role as trappers as well as voyageurs of the fur trade. The fur trade facilitated Métis settlement along the Athabasca River, where they hunted and established farms. In 1811, David Thompson, along with an Iroquois guide named Thomas, crossed the Rockies through Athabasca Pass, an area that would serve as a transportation route for many years. Jasper National Park, in the Upper Athabasca River, was created in 1907, displacing the Aseniwuche Winewak Nation from their traditional territory, who were forced to settle downstream or north of the Athabasca River. 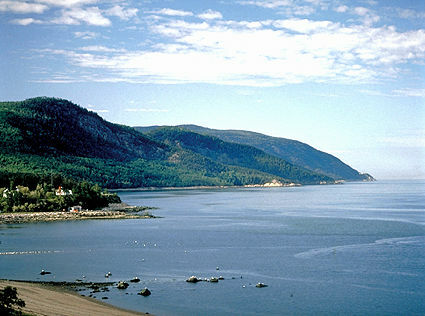 The land surface area surrounding a river, typically bounded by higher elevations, where all of the rainfall or snowmelt flows into that river. The average volume of water that flows out of the river over a specific unit of time, usually cubic metres per second. The average is calculated for the entire year, but there are months when flow is naturally higher or lower. A river or stream that flows into a larger river. The point at which the two rivers meet is called the confluence. Alberta Government, “Aboriginal Peoples of Alberta: Yesterday, Today, and Tomorrow” (2013); Candler, C., Olson, R., and DeRoy, S., “As long as the rivers flow: Athabasca River knowledge, use, and change” (2010); Environment Canada, “The joint Canada/Alberta implementation plan for oil sands monitoring. First annual report: 2012–2013” (2013). Athabasca River Basin Research InstituteFind information about the Athabasca River and its basin from this interdisciplinary research centre. Canadian Heritage Rivers SystemThe Athabasca River is a designated heritage river. Find information, maps and fact sheets about the Athabasca River from the heritage river system’s governing body. Peace-Athabasca Delta Ecological Monitoring ProgramUsing Western science and traditional indigenous knowledge, this organization monitors the health of the Peace-Athabasca delta. Athabasca Watershed CouncilFind information about the Athabasca watershed from this non-profit organization promoting the health of the Athabasca River and surrounding area.